Sunflower oil is a very common ingredient found in every household. Confection sunflower seeds and non-oil sunflower seeds are the 2 types of sunflower seeds. Among these, the confection sunflower seeds are edible, and used to extract the oil. It is light oil, which has a pleasant taste. The refined oil has a pale yellow color, and is widely used. It has numerous benefits for your health, skin, and hair. Read on to know how you can use the oil to treat all your issues. The Vitamins A, C and D, and other healthy carotenoids and waxes protect your skin by forming a protective barrier on it. It is non-greasy and light, and is absorbed well in to the skin. Moreover, it does not clog or block the pores. It treats acne effectively. The fatty acids and vitamins help regenerate skin cells by acting as antioxidants. It also gets rid of bacteria that cause acne. Sunflower oil is rich in beta carotene. It is actually a fat soluble compound which is highly pigmented. It can be converted to Vitamin A. Moreover, it has got antioxidant properties, which are good for the health of your skin. As such, the free radicals are neutralized. These free radicals are responsible for causing sunburns, skin cancer and other sun damages. Consuming sunflower oil gives you enough beta carotenes to make your skin become less sensitive to the sun. Sunflower oil is a natural emollient, which increases the capacity of your skin to store moisture, and helps those with dehydrated, dry, or sensitive skin. Sunflower and castor oil together make your skin soft and supple. It is a cleanser and a moisturizer at the same time. Sunflower oil helps in retaining the moisture content in your skin. It can be used as a lotion for pre-term infants to reduce skin infections and make a protective barrier against all issues. It offers daily skin care. Massage daily with this oil to get its benefits. Signs of premature ageing are prevented by the antioxidant properties of sunflower oil. Compared to shea butter or almond oil, sunflower oil contains more amount of Vitamin E. it saves your skin from damage by the harmful UV rays from the sun. it prevents scarring of the skin and makes your skin appear more beautiful and makes it healthy. It also makes any existing wrinkles smooth. Sunflower oil is light and can be used for eye and skincare. It has a mild scent, which makes it apt for aromatherapy. Several skin products use sunflower oil because of its property to make the skin smooth. It is suitable for all skin types ranging from normal to dry. Sunflower oil conditions greasy hair. This is because it is so light. Moreover, it keeps your hair nourished and fights breakage of hair. Sunflower oil is rich in gamma alpha linolenic acid, or GLA. This compound fights against thinning of hair. It treats all problems like baldness and hair loss. Alopecia areata is a condition which causes round patches of lost hair on the scalp. This condition is treated by using sunflower oil. Sunflower oil has a light texture and a mild flavor. This makes the oil suitable for making your hair soft. It also adds a really beautiful sheen to your hair. Frizz is effectively controlled if you use sunflower oil. The oil also fights against dryness and damage. Your hair becomes manageable. It is versatile oil, which acts as a natural conditioner. It helps in maintaining your hair’s luster and texture. Use sunflower oil once in a week to get all its benefits. Before you have a bath, apply the oil and massage it well so that your scalp absorbs it. Sunflower oil is very useful for preventing the occurrence of arthritis. 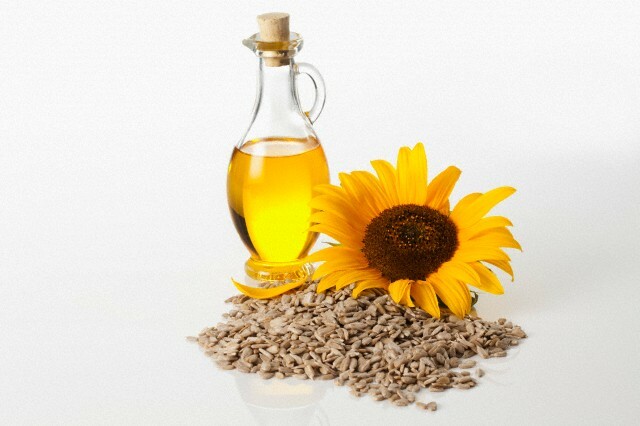 The Vitamin E in sunflower oil protects you against colon cancer and asthma. Proteins are needed for the body to repair itself and produce enzymes and hormones. Sunflower oil contains proteins, which fulfills the body’s requirement, and thus helps repair the body tissues. Sunflower oil contains lots of Vitamin E, and a very low amount of saturated fats. Phytochemicals like choline and phenolic acid in the oil are good for your heart. Sunflower oil has the property to lower the risk of cardiovascular diseases, and reduces chances of a heart attack. Selenium in sunflower oil reduces risk of cardiac problems , lung and skin cancers, and hepatic degradation. Sunflower oil contains monounsaturated and polyunsaturated fats. They provide energy to the body and help maintain the correct ratio of LDL/HDL in the body. The lecithin is very useful for reducing the level of cholesterol. It prevents fat and cholesterol from sticking to the cells by itself sticking to the cell. Being rich in Vitamin E or tocopherols, sunflower oil acts as an antioxidant. They neutralize the free radicals that lead to cancer. Free radicals can damage the immune system and the cells o the body. The zinc content in sunflower oil is useful for making your immune system healthy, healing wounds, and keeping your body strong. It also helps in maintaining your sense of taste and smell. Pre-term infants with low birth weight are saved from risk of getting infection by consuming sunflower oil. It forms a protective barrier to prevent infections. Vitamin B in sunflower oil makes your nervous system healthy, improves digestion, and provides loads of energy. Sunflower oil contains carotenoids, which help prevent lung, skin, and uterine cancer. The Vitamin A helps prevent cataracts. Sunflower oil has got lots of benefits for your skin, hair and health. All these benefits make it a very useful ingredient in a number of products.